In order to understand how these units can be used in North America, it might be helpful to give a brief outline of the UK power system and the differences from UK practice. In the UK, the final distribution transformer tends to be large. In urban areas, it may be around 1 MVA, and may serve a few hundred homes. It will be three-phase with star-connected secondaries. The star point, which is the neutral, will be earthed. The secondary voltage is nominally 240 V line–neutral, giving 415 V between phases. The frequency is 50 Hz ± 1%. Although large commercial and industrial premises will have a 3-phase supply, many small industrial units will have only a single phase. Anything other than a single phase supply is very rare for domestic consumers. The normal rating of the domestic supply will be 80 or 100 A. The supply authority will provide a fuse, a neutral link and a meter. From that point on, the wiring is the responsibility of the consumer. The cables between the meter and the “consumer unit” are called “meter tails” and will normally be 16 mm2 or 25 mm2 copper, with a maximum diameter over the sheath of about 10.5 mm. High current appliances, such as cookers or showers, will normally be fed by a dedicated circuit breaker, but the socket outlets for general use with portable appliances are almost always fed by a “ring final sub-circuit” – comprising essentially a loop of cable starting and ending at a 32 A circuit breaker, which feeds an unlimited number of socket outlets, subject to a maximum floor area served of 100 m2. Each appliance plug is fitted with a fuse rated at between 1 A & 13 A. Lighting points are normally daisy-chained and supplied by a 6 A circuit breaker. Compared to the UK, the North American final distribution transformer tends to be quite small, serving only a few homes. The normal domestic supply is 240 V, 60 Hz centre-tapped, and the centre tap is the neutral, which is also earthed. Figure 1. North American Domestic Electricity Supply - final transformer voltages. The voltage tolerance is ±5% and the imbalance between the two legs has been reported to be better than 2 V, although there is no actual specification regarding voltage imbalance. Load centre (circuit breaker panel) layout enables an electrician to distribute the loads between the two legs when the wiring is installed. Standard practice among US electricians is to connect the circuits to the breakers in numerical sequence, with odd numbered breakers connected to one leg and even numbered breakers connected to the other leg. Thus, half of them will be on one leg, half on the other leg, with the aim being to balance the load evenly. Because there are three wires (discounting the protective earth conductor), classical theory dictates that two wattmeters are needed, and for ‘wattmeter’ read a pair of voltage and current measurements. Unfortunately, the emonTx has only one voltage input, therefore a compromise is required. Fortunately, because the voltage balance between the two legs is good, little error is introduced by assuming the voltages are equal in magnitude. However, two current measurements are always necessary. Again, in theory it does not matter which voltages and currents are measured, but in general, it will be more convenient to arrange the voltage transformer to measure the voltage of one leg to neutral, and to attach a current transformer to each leg. Figure 2. North American Domestic Electricity Supply - Measuring whole-house power. Figure 3a-b. North American Domestic Electricity Supply - Alternative arrangements for measuring whole-house power. Individual circuits may be either 120 V using a connection between one leg and neutral, or they may be 240 V, i.e. connected to both legs. Figure 4a-c. North American Domestic Electricity Supply - Alternative arrangements for measuring individual circuits. If the circuit is 120 V, only one CT is required and the set-up is as shown in Fig 4a or Fig 4b above. Note: The orientation of the CT In Fig 4b is not symmetrical with the CT in Fig 4a. If the circuit is purely 240 V, i.e. there is no neutral connection, again only one CT is required. However, the power must be doubled, as the voltage measured is only half the voltage applied to the load, as in Fig 4c. If the circuit is “mixed” 120 V and 240 V, i.e. the main load is 240 V but there is a neutral connection to supply for example a timer, an indicator lamp or similar low power device, then it might be acceptable to ignore the 120 V load and treat the load as a “pure” 240 V load and the arrangement of Fig 4c can be used. There will however, be a small error. If the 120 V load cannot be ignored, i.e. the error is unacceptable, the load should be treated as a “whole house” with one of the arrangements of Fig 3 shown in the section above. The obvious way to connect the current transformers is to have each connected directly to an input. This arrangement is necessary if, for example, it is desirable or necessary to be able to balance the currents in each leg of the supply. But if only the total power is required, then a single input can be used, releasing the second for another circuit. This arrangement is suitable for ‘voltage output’ CTs having an output voltage of 1.0 V at rated current. A ‘voltage output’ CT is not suitable for this connection arrangement. In Fig 5c, the burden voltages are summed; each burden value is calculated to give half of the maximum input voltage for the maximum current. If the CTs are not identical, the burden resistors must be chosen so that they develop the same voltage for the same primary current. This arrangement is suitable for ‘voltage output’ CTs, but the output voltage at rated current should be approximately 0.55 V (0.75 V for the emonTx Shield). Note: The manufacturer adjusts the turns ratio to give the correct output current. The burden & calibration coefficient are calculated for Fig 5a arrangement only. 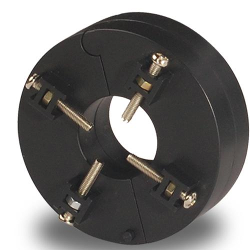 Magnelab offers a 1, 2 & 5 Volt output option on both the UCT and the SCT ranges of split-core CTs, which are available through their distributor, Aim Dynamics. For consistency with the standard YHDC CT supplied by the shop, connect the white wire to the plug tip and the black wire to the sleeve. There should be no connection to the ring. Note: Byram Labs offer a full range of Wattcore CTs, in particular the WC4 for 100 A, 200 A, 300 A or 400 A input, and in 0.5 V and 1.0 V output versions. Note that these are calibrated at 60 Hz, “Option 50 Hz” must be specified for use on a 50 Hz system. “Option 1V” & “Option NL” must be specified for use with the emonTx or emonPi. “Revenue Grade” versions (having better accuracy) are also available, see the manufacturer's website for details. CCS also makes CTs that are rated up to 6 kA primary current. The 11 Ω burden is very easily arranged in both the emonTx and emonPi by soldering a 22 Ω wire-ended resistor in parallel with the internal 22 Ω burden resistor, using the holes provided immediately behind the CT input socket. Do not remove the SMT burden resistor. A 14 V transient voltage suppressor is fitted internally inside the CT to protect against dangerous voltages. The accuracy is better than ±1%. For consistency with the standard YHDC CT supplied by the shop, connect the white wire to the plug tip and the black wire to the sleeve. There should be no connection to the ring. Other output currents and voltage output versions & “Revenue Grade” versions (having better accuracy) are also available, see the manufacturer's website for details. The rated output current of 50 mA means that no change is necessary when used with the emonTx, the emonTx Shield or the emonPi. If it is desired to increase the sensitivity, then the burden resistor may be changed to a higher value, up to the maximum given in the table above. Alternatively, the burden resistor may be reduced in value to decrease the sensitivity, whilst remaining below the maximum input current. A 3.5 mm ‘stereo’ jack plug is required. For consistency with the standard YHDC CT supplied by the shop, connect the white wire to the plug tip and the black wire to the sleeve. There should be no connection to the ring. Note that the mounting screws must not be allowed to damage the insulation of the cable on which the transformer is mounted. See the manufacturer’s website for further details. If you use an alternate CT, i.e not the YHDC CT sold in the OEM shop and the emonTX's on-board SMT burden resistor is the wrong value or is not required, then you must remove it and, if (and only if) that CT is unburdened, add a wire-ended resistor in its place using the holes provided. This list is not exclusive, other suitable current transformers are available. If you have any doubt as to the correct current transformer to specify, please enquire in the forums. A suitable ac-ac adapter is available from the shop. 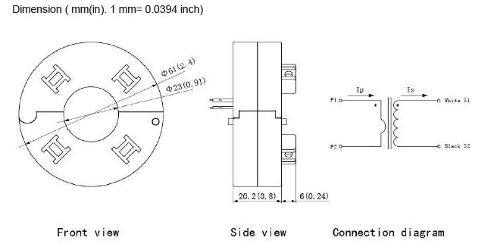 This adapter is only suitable for connecting Line–Neutral at 120 V (As in Fig 2, Fig 3b, Fig 3c or Fig 4 a-c). In general, there is no legal requirement for the local energy provider to purchase customer generated power. However, most energy providers will pay the customer for excess energy generation, but at a rate substantially less than the rate at which the customer pays for energy. Metering is regulated by the local energy provider, city government, energy cooperative, etc. All modern meters used in the US, both mechanical and electronic, employ anti-theft mechanisms, i.e. their displays register an increase in energy consumption regardless of the direction the energy flows through the meter. It is possible an owner of a PV system could end up paying for the excess energy they produce. 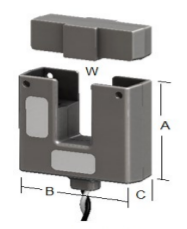 US Meter sockets are built in a manner that allows insertion of a meter in the socket in two ways, i.e. the meter can be inserted in the socket upside down. It wasn't uncommon, especially for rural customers, to break the meter seal, pull the meter out of its socket and re-insert the meter in the socket upside down. The meter—Ferarris type—would spin backwards, and decrement the reading. When the energy providers caught on to this, they installed ratchet mechanisms in the meters that prevented the reverse rotation, but they still lost revenue. Even though the meter did not turn backwards, it didn’t turn at all if it was in the socket upside down. With the advent of electronic meters, the solution was simple, build the meter so that it incremented the count regardless of the direction the energy flowed through the meter. Changing the construction of the meter such that it could be inserted in the socket only one way would have solved the issue, but that never happened. In some locales, If a customer has energy generating equipment, installation of a net meter will be required. This will depend entirely on the energy provider's rules regarding customer-generated energy. If it is not a requirement, it is likely the customer can request net metering. The net meter has three “registers” that tally kWh delivered to the customer, kWh delivered to the grid, and the nett difference between those two amounts. The display on a net meter typically “rotates” through the three readings, pausing on each for a few seconds, as compared to the regular meter’s static display. Almost anyone who has a net meter should know it, since they had to ask their energy provider for it. If a person didn’t actually make the request for the net meter e.g. they buy a home with a PV system, and have no knowledge of PV, they might not know they have a net meter. The need for an energy diverter? If a customer-owned energy generation system is producing excess energy, and net metering is not in place, an energy diverter will be needed to avoid the scenario described above. However, net metering is employed by most, if not all, US energy providers. Therefore, the need for a diverter might be temporary, or non-existent. It depends on the energy provider’s rules regarding customer-owned generating equipment and connecting said equipment to the grid, and the tariff structure. The larger cities tend to be much stricter than the smaller communities. In much of rural America, energy providers have no experience with, or knowledge of, PV systems. The OpenEnergyMonitor guide Choosing an energy diverter might provide some further useful information. Spare digital outputs for SYNCPIN & SAMPPIN are not available. DIO7 is available on a pad and might be usable for either, with care. These outputs are intended for development & testing only, and are not required in normal operation. (See Diverting surplus PV Power, by Robin Emley) The only change necessary is to alter CYCLES_PER_SECOND to 60.